Alaska Gov. Bill Walker launched a broadside against the Legislature on Wednesday, holding a news conference in Juneau to accuse lawmakers of shirking their responsibilities by passing a budget that would use about half the money left in the state's primary savings account. "Do we have to go broke before we fix Alaska? I guess that's my question to the Legislature," Walker said. He added: "It's time we stopped talking about the upcoming election or the re-election, and start making decisions about what's best for Alaska right now." The governor wouldn't say whether he would sign the budget or veto portions of it — a decision he would have to make in just over two weeks after getting the budget bill from the Legislature. He said he'd wait to see how much progress lawmakers make on the remainder of his deficit-reduction financial package during the rest of their special session in Juneau. That package includes a proposal to restructure the Permanent Fund into an endowment-like account to help pay for state government, as well as a personal income tax and tax increases on alcohol, tobacco, mining and commercial fishing. Walker says those measures could produce a balanced budget by 2018 that preserves residents' Permanent Fund dividends, albeit at smaller levels. Continuing with deficit-funded budgets could ultimately wipe out the dividend altogether, he says. Aside from starting the budget at a lower level than last year, none of Walker's reform proposals were in the bill lawmakers passed Tuesday to pay for the state's next fiscal year beginning July 1. Legislative leaders said they'd consider Walker's proposals later in their 30-day special session, now over a week old, but wouldn't commit to advancing them to the House or Senate floor for up-or-down votes. House majority leader Charisse Millett, an Anchorage Republican, said Tuesday that Walker "has to engage" in the legislative process. Walker didn't mince words in his response Wednesday, saying his administration had traveled "thousands of miles" across the state to educate Alaskans and legislators about his financial proposals. A poster next to his podium showed a tally of more than 400 meetings his administration says it has held with lawmakers, as well as town halls and legislative hearings. "If somebody doesn't understand the plan at this point, or a legislator feels that we haven't done enough, I'd say they have not paid enough attention to what we've been doing," Walker said. Another recipient of the Walker administration's ire was lawmakers' accounting. Republican legislative leaders described their spending plan for next year as less than $4.3 billion, with a $3.2 billion deficit. But Walker's administration said the true deficit was more like $3.8 billion. That's because, administration officials said, lawmakers stuck more than $600 million in additional spending outside of next year's budget. One example was $430 million for cash subsidies for oil and gas companies which the Legislature placed into the 2016 budget, expiring in 30 days, rather than in the 2017 spending plan. With a $3.8 billion gap, said Walker's budget director, Pat Pitney, lawmakers won't be able to sustain their deficit spending after next year. That's because Alaska's primary savings account, the Constitutional Budget Reserve, is projected to have $6.5 billion remaining at the start of the state's new fiscal year July 1. "This is the last year we have with that particular tool," Pitney said. In a prepared statement, Senate Republican leaders defended what they termed "real budget cuts," highlighting their criminal justice and Medicaid reform efforts. "This budget did not use smoke and mirrors to artificially show cuts to the budget," the statement quoted Sen. Pete Kelly, R-Fairbanks and co-chair of the Senate Finance Committee, as saying. "We delivered a straightforward budget for the people of Alaska, which made actual cuts to state government." 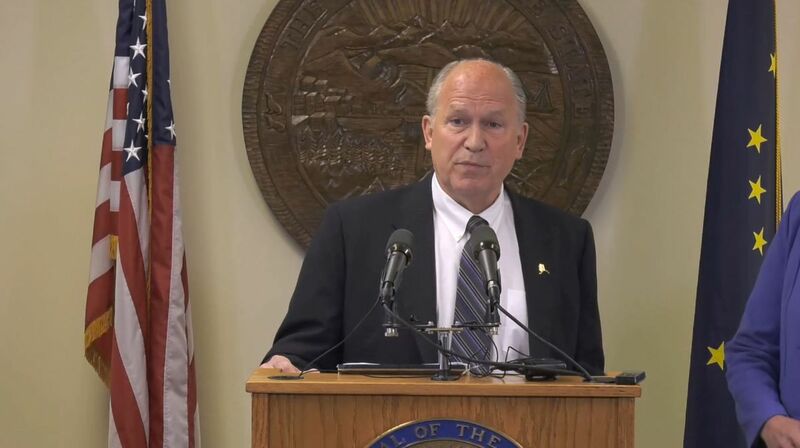 Press Conference: Special Session from Alaska Governor Bill Walker on Vimeo.